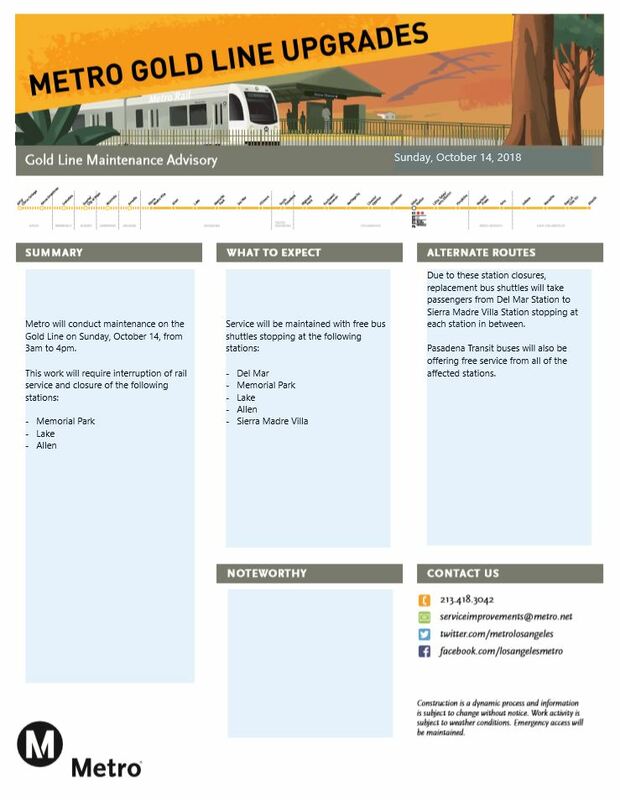 On Sunday, October 14, from open until 4 p.m., there will be no Gold Line service to Memorial Park, Lake and Allen Station due to scheduled track maintenance. Free bus shuttles will replace trains between Del Mar and Sierra Madre Villa stations throughout the closure. This means all northbound trains will travel as far as Del Mar and turn back toward Union Station. The last stop for all southbound trains will be Sierra Madre Villa. From there, trains will return to APU/Citrus. The Gold Line is scheduled to run every 12 minutes while work is in progress, and shuttles will match train service as best as possible. Please allow extra travel time to transfer between trains and bus shuttles. Metro personnel will be at the affected stations to lend assistance. Regular train service will resume at 4 p.m. on Sunday. Pasadena Transit will also be offering free shuttle service to the affected stations; Route 10 and Route 40 buses travel fairly close to the Gold Line. As always, thank you for your understanding as we work to improve the Gold Line. Be sure to follow us on Twitter at @metrolaalerts for the latest service updates. For routes and schedule information, visit Metro.net or call 323.GOMETRO. The maintenance occurs almost every day, and the timetable is basically useless. Would that actually be more practical to shut down the whole line for a day or two and do the maintenance all at once? Just a thought.